Mazda is introducing a special ‘Pay no VAT' offer on most models in the Mazda line-up, from the Mazda2 to the Mazda6, meaning the Japanese manufacturer's sporty, dynamic range now starts from just £8,672 (on-the-road)*. The ‘Pay no VAT' campaign is made even more appealing by the offer of 0% APR finance over four years with only a 30% deposit** required. 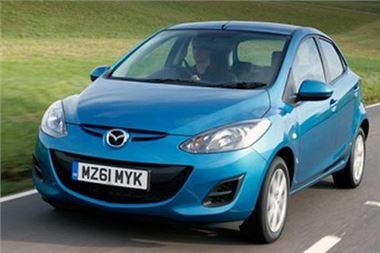 The ‘Pay no VAT' campaign (equivalent to a 16.67% discount) was launched for diesel Mazda6 models in November, and has now been extended to include the Mazda2, Mazda3, Mazda5 and Mazda MX-5 models registered from now until 29 February 2012. All Mazda6 petrol and diesel models will also be available with no VAT, 0% APR until 31 March 2012. "The ‘Pay no VAT' campaign makes a really compelling offer to consumers, saving them up to £4,000," comments Peter Allibon, Sales Director, Mazda UK. "There has never been a better time to buy a brand new Mazda and extending the offer across much of the range means everyone can benefit from the ‘Pay no VAT' campaign, whether motorists are purchasing the super-practical Mazda5 or the sporty two-seater Mazda MX-5 roadster. "We are confident that no VAT together with our 0% APR finance offer will attract large numbers of newcomers to the Mazda brand. It will also reward existing Mazda owners, as many of them will be able to benefit from ‘zero cost to change' when trading in their current cars for a brand new Mazda. Customers should visit their local dealership to check which models will be available under this programme and book a test drive," adds Allibon. This latest ‘Pay no VAT' offer is available only on selected Mazda models while stocks last and must end on 29 February 2012 (31 March 2012 for selected Mazda6 models). As well as offering 0% APR finance on Conditional Sale (with a 30% deposit**) over 48 months, Mazda is also offering low-cost, 6.9% APR Representative finance on Personal Contract Purchase (no minimum deposit) up to 36 months for all models. "All vehicles in the Mazda model line-up deliver a dynamic and engaging drive, with strongly performing engines, competitive CO2 emissions and an ownership experience which is underpinned by reduced costs and Mazda's outstanding build quality and reliability," concludes Allibon.